Preview: Head coach Chris Petersen decided to make the plunge into the Pac 12 after having tremendous success leading Boise State to one of the most successful stretches of any team in college football history. In his first year as the head man Chris Petersen implemented his system with varying success leading the Huskies to an 8-6 campaign. 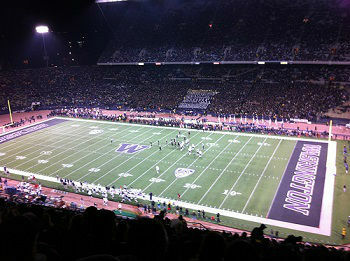 Washington was able to reach a bowl game where they fell to Oklahoma State by a final of 22-30. The Huskies lost some key players to the NFL and the team returns just 10 starters, but there’s no reason to doubt Petersen’s process as he transforms this program. Inconsistency on the offensive side of the ball plagued the team in conference play last season and the first order of business will be to find the next starting QB. The battle will be between promising throwers Carta-Samuels and Browning, with Carta-Samuels having the edge due to his year already in the program. The new starting QB will work behind an O-line that’ll be in somewhat of a rebuilding mode with just 1 returning starter back, but there are former backups with experience that can step in. The run game has promise with starter Dwayne Washington back and ready to breakout. The pass game has a wealth of prospects ready to contribute at the receiving positions. The defense showed promise throughout the 2015 campaign, but this group will have to be reformed with just 4 returning starters back in the mix. The D-line doesn’t return any starters and now is as good a time as any to switch things up to a more 3-4 heavy scheme. The big question will be whether or not this group will be able to stop the run with so many new faces looking to make a name for themselves up front. The LB corps also took major losses with Timu and Thompson moving on. The unit returns 1 starter and will build around veteran Travis Freeney. What was once a weakness is now a strength as the young secondary has grown and now returns 3 starters. Prediction: There’s a lot of confidence in head coach Petersen to turn Washington into a Pac 12 contender and the fan base will be patient with this rebuilding group that returns just 10 starters. There will be a new face at the QB position and road bumps will surely follow on the offensive side of the ball. A brutally tough opening road game against Boise State doesn’t make things any easier for a head coach that’s trying to establish himself at his new home. A tough nonconference slate mixed with a 9 game Pac 12 schedule could mean the Huskies fall short of a bowl game in 2015. The goal of this squad has to be developing their young talent with the right mindset.